The annual meeting of U.S. Conference of Catholic Bishops last week fizzled like a Roman candle. The bishops were prepared to adopt a stern policy and strict guidelines for dealing with predatory priests. But minutes before the discussion, an emissary from the Vatican instructed the bishops to forestall a vote. A long-time observer of politics in Maryland discusses the Catholic Church at a crossroads. Frank A. DeFilippo is an award-winning political commentator who lives and writes in Baltimore. He served as press secretary and speechwriter in the administration of Maryland Gov. Marvin Mandel. Back in the dark ages, around 1970, the prelates of the three Roman Catholic archdiocese and diocese that straddle Maryland – Baltimore, Washington, D.C., and Wilmington, Del. – sought a meeting with Gov. Marvin Mandel (D) to discuss one of the church-bell issues of the day, aid to parochial schools. As press secretary to Mandel (and a former altar boy), I briefed Mandel, Maryland’s first and only Jewish governor, on the proper titles and greetings for the princes of the church – your eminence for the cardinals of the Archdiocese of Baltimore and Washington and your excellency for the Bishop of Wilmington. A decade before that event, when Woodstock College, in Howard County, was the intellectual center of the Catholic universe, the reigning Jesuit theologians of the era were Avery Dulles, John Courtney Murray and Gustav Weigel. At a social gathering during that pre-Vatican II time, Weigel was asked what could be done to modernize the church: “Abolish the Papacy,” Weigel snapped without missing a cadence. Whether he was jesting or deadly serious, the response hung in the air like a musty artifact, but was never more appropriate than last week in Baltimore. Weigel’s blunt observation goes directly to the heart of the annual meeting of U.S. Conference of Catholic Bishops that fizzled like a Roman candle (appropriate pun) after a dramatic and hyped build-up. The church’s 196 American leaders were cut short by the Pope. They were prepared to adopt a stern policy and strict guidelines for dealing with predatory priests and banished prelates in cases of sexual abuse that are wrecking the church. But minutes before the discussion was to begin, it was announced that an emissary from the Vatican instructed the bishops to forestall a vote until after a February conclave of world Catholic leaders meets in Rome to consider the matter rather than divide the Church over the issue. Decoded, the bishop apparently meant that Roman Catholic clergymen take a vow of obedience to an ultimate constituency of one. And though President Trump and his fellow travelers have given the word a bad name, the church is, in that regard, one of the few legitimate top-to-bottom authoritarian organizations, though it reports to a higher authority. Simply put, the Pope is boss. The word, Pope, translates as “papa” or “father.” The Pope, after all, is believed by Catholics to be the Vicar of Christ on earth, thus the Holy Father. And infallibility in matters of faith and morals is a nice tool to have, though it is rarely invoked and does not apply in this instance. The American bishops, taken as a group, have, in many ways, always been a step ahead, or a step behind – depending on a point of view – much of the Church. When the ecumenical council was convened in 1869 to consider the issue of infallibility, for example, the cohort of American bishops was strongly opposed to such a doctrine. And leading the fight with them as the most outspoken opponent against infallibility was England’s Cardinal William Henry Newman, the leading Catholic intellectual of the era. All of which allows that for a strictly disciplined authoritarian organization, which warns of serious eternal consequences for disobeying its dictates, there is room for dissent and disagreement – but proceed at your own risk. Defiance can merit a light singe or a severe burn, depending on the gravity of the offense – hard time in the eternal barbeque pit. In the sublime poem, Dante’s Divine Comedy, there is a certain space reserved for those who fail to take a stand in a time of moral crisis. And that seems to be the precipice on which the Church is teetering at the moment. By failing to act, the Church is withholding the moral guidance that is promised in the Baptismal bond with Christ and his ministry. It is called Faith. Oh, yes! The Church has been there before – the Inquisition, the Crusades, the corruption that permeated the Papacy throughout the middle centuries (the Medicis and the Borgias again). But the Church is, after all, the world’s largest precinct organization with something like 1.2 billion members. But they don’t get to vote, a la carte, on issues they must abide. The problem of sexually abusive priests is not a uniquely American problem. It is a worldwide disgrace. There have been shameful examples far and wide – Ireland, Mexico, the Philippines, in Asian branches of the church as well as in Eastern Europe. Pope Francis is said to have shielded abusive priests when he was a cardinal in his native Argentina and he is accused of delaying action on the Church’s problem now, considered by many its most serious crisis in moral leadership. And the problem is not confined to the Catholic Church. Whether they be of Jesus, Moses or Mohamud, there have been incidents involving many different Protestant denominations as well as the several branches of Judaism. Cultural abuse of women is pandemic in the Muslim world. The difference in the levels of moral outrage is that other religious denominations are not as universal or as centralized in structure as Catholicism and therefore individual cases receive far less public attention. And in many instances within Protestant and Jewish denominations, sexual abuse involves misbehavior toward women as well as predatory assaults on men. It begins in the seminaries. The older priests, confessors and mentors, prey upon the young and intimidated novices in much the way Cardinal Theodore McCarrick is said to have invited them to his bed. The sexual abuse radiates like a malicious scourge to those who are later exposed to the transmitted predation – fellow priests, parishioners, altar boys, youngsters within the parochial school system. 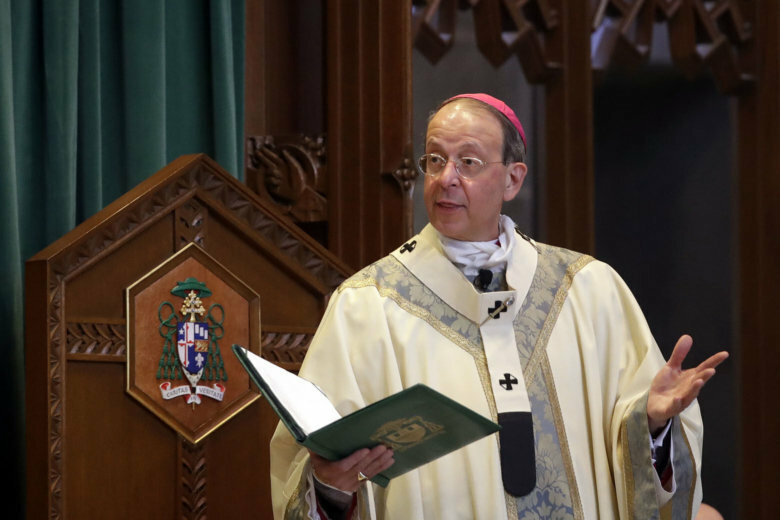 Baltimore’s Archbishop William E. Lori, conservative in many ways and the host for the gathering in American’s Primal Sea, was among the most outspoken of the prelates advocating adoption of the new guidelines on sexual misbehavior by clerics. And Cardinal Daniel DiNardo, head of the bishops’ conference, appeared as if someone had just punched the wind out of him when he had to announce the Vatican’s edict to delay. Lori, whose Baltimore Archdiocese brackets central Maryland and much of the state to the west, has been openly working with the state attorney general, Brian Frosh (D), to catalog abuses and abusers within the archdiocese. And Lori has ordered the name of his predecessor, Cardinal William Keeler, expunged from a school for cover-ups of abusive priests when he was bishop of the Harrisburg, Pa., diocese. But it is the Archdiocese of Washington, which takes in all of Montgomery and Prince George’s counties, that has suffered the greatest embarrassment. Two of its highly regarded prelates – McCarrick and Cardinal Donald Wuerl, have been unmasked – McCarrick stripped of his robes and red buttons and banished to a remote monkery in Kansas, and Wuerl, forced to resign for cover-ups when he was bishop of the Pittsburgh diocese. Both Keeler and Wuerl were revealed in the devastating report by the Pennsylvania attorney general. McCarrick was exposed in a lengthy report in The Washington Post. Changes within the Roman Catholic Church come slower than evolution, recognition of its strength of immutability and durability as well as its weakness to adapt, and that is not to suggest bending to every nascent cultural whim. At its worst, the Church is secretive and unyielding. The Church, like every other current governing body, is fractured within and without. Its college of cardinals, divided like society at-large between conservatives and liberals, when not publicly displaying obedience to the Pope, is at each other’s throats. It was a conservative cardinal who publicly accused Pope Francis of cover-ups. And the faithful who remain are fractured between traditionalism and openness to modernism. The Church has no tolerance for contemporary community standards, the idea of adapting to changing behavioral memes. In a shameless display of a double standard, the Church has shielded predatory priests and allowed them to administer the sacraments, but the Church refuses to allow gays and lesbians to participate in them. The faithful who have attended Sunday mass regularly are dropping out noticeably for a variety of personal reasons, including the Church’s inability to deal with the crisis over sexual behavior. Personal protests are manifesting themselves in other ways, too, such as withholding envelopes from the collection basket, boycotting other services and even protesting publicly. Churches, big C and small, used to be one of the three pillars of civilized society, along with family and state. Together the three are slowly crumbling.